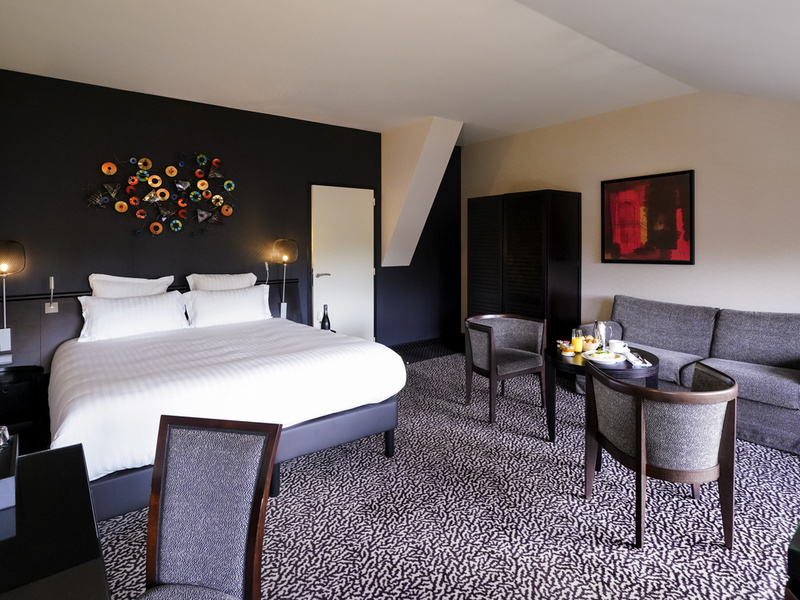 In a green setting where the Moselle and Seille rivers meet, La Citadelle is a haven of peace which enjoys a privileged location in the historical and cultural heart of Metz. From your luxurious room or suite, the heart of Metz is at your doorstep. Enjoy the quality of life of this city at the crossroads of Europe. Its rich, eclectic heritage is largely due to its historical monuments. La Citadelle is a haven of peace in the historical and cultural heart of Metz. Effortlessly combining the style and character of yesteryear with contemporary aesthetics and style, this unique boutique hotel is an unforgettable and refined place. 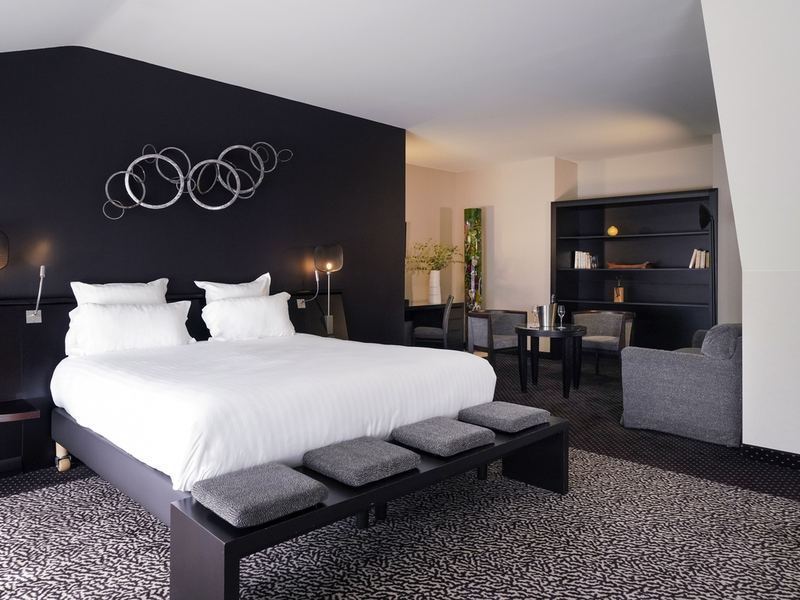 ..
Stay in a unique hotel that's a few steps from the heart of Metz, a city replete with history. Near Germany, Luxembourg and Belgium, Metz is located at a cultural and economic crossroads. With its sleek lines and stone vaults, Hôtel la Citadelle MGallery by Sofitel charms you with its modern elegance - starting from the lobby and continuing throughout the historic building. Touches of red enliven soft hues in this 4-star boutique hotel. In this centrally located hotel in Metz, discover the authenticity of a refined brewery and virtuosity of a renowned chef who magnifies the treasures of nature. Savor all the richness of French produce during a cooking or wine-testing class. From an intimate dinner to banquet, add refinement and gastronomy to your events with a superb reception room and excellent caterer. For business or pleasure, experience memorable moments at the Hotel La Citadelle MGallery by Sofitel. From an intimate dinner to large banquets, add sophistication and gastronomy to your events with a spectacular reception room and world-class catering. Whether for a meeting or overnight stay, Hôtel la Citadelle promises many memorable moments. Metz, capital of Lorraine, is situated between two of the most iconic rivers in France: the Moselle and the Seille. Steeped in history, its heritage goes back to the time of the Celts, well before Caesar invaded Gaul. The hotel is particularly easy to reach, ideally positioned in the city center, close to the pedestrian zone and adjoining the Arsenal concert hall and the Parc de l'Esplanade. Located 3 minutes from Metz train station, 15.5 miles (25 km) from Metz-Nancy Lorraine airport. By car from the A31 highway, Metz centre exit is 3 minutes away. Combining stone, glass and steel, the Citadel exudes its imposing architecture and contemporary decoration: richness, charm and refinement. All 66 rooms and 2 suites offer an abundance of light. conserved to give them true charm. Amid the sobriety, some bold touches embellish the chromatic combinations of gray and wenge. In your vast Junior suite, the minibar and courtesy platter invite you to linger over a gourmet break. Savor an espresso while enjoying views of the park or Palais du Gouverneur. Spacious Classic Room (323-377 sq. ft./30-35 m2) with a double bed (63"/160 cm). Understated decor based on a chromatic harmony of wenge, red and gray. Bathroom with bathtub, separate toilet. 30 m² (320 sq. ft.), combining character and modernity, 32" TV, minibar, safe, courtesy tray with Segafredo coffee and Lipton tea, bathroom with tub, bathrobes, slippers and Clarins products. 35 m² (375 sq. ft.), our spacious, functional rooms are equipped with a Nespresso machine, safe, 32" TV, bathroom with tub and shower, bathrobes, slippers, Clarins products. Comfortable and cozy Suite measuring 700 sq. ft. (65 m²) where space and light are key features. Option of a sofa bed for children. (Supplement depending on age). Understated decor based on a chromatic harmony of wenge, red and gray. La Citadelle room service is available every day for lunch and dinner. Our products are carefully selected from the brasserie menu. When the brasserie is closed, assorted cold meats are available. "La Table" restaurant's chef transforms authentic products into exceptional dishes. With our cooking and wine courses, you can recreate delicious gourmet meals in your home. Seven days a week, Christophe Dufossé brasserie welcomes you every noon and evening with elegance and simplicity all year round. Meetings, conventions, product launches, incentives: because above all a meeting must bring everyone together and ensure success, La Citadelle brings your seminars to life in a prestigious and exemplary hotel. Upscale catering options adapted to your needs, dedicated staff, a room set up to your requirements: La Citadelle offers attention, discretion and efficiency. As the big day draws to a close, newly-weds and guests can reach their rooms in just a few minutes. The newly-weds can enjoy a four-poster bed in the honeymoon suite... The perfect opportunity for the couple to prolong their romantic moment. Share romantic memorable moments in this boutique hotel, where newlyweds receive a special personalized welcome. With an early check-in and late check-out, you can prolong the magic and sweetness of your honeymoon. MGallery hotels offer visitors a wide range of services to ensure maximum comfort. Our friendly and attentive team are on hand throughout your stay.